Sometimes some levity is needed. Tonight Alaska Airlines very responsive social media team provided that for us. This post is frivolous but hopefully fun; please don’t read too much into it! 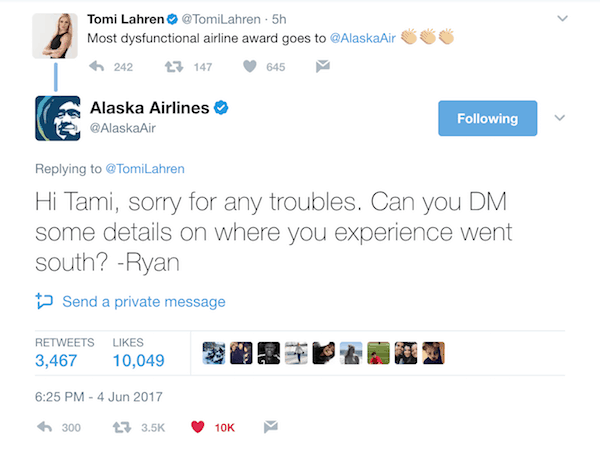 Tomi Lahren, an alt-right political commentator, was having some problems with her flight from Spokane to Seattle today. She tweeted out “Most dysfunctional airline award goes to @alaskaair”. While I would beg to differ, that isn’t the point. I’m sure she had her reasons (delayed flight, lost baggage, who knows) for expressing this frustration. Omg. You win the internet today. I’ll fly Alaskan airlines from now when possible just for that typo. I swear I’m flying @alaskaair the next chance I get. And numerous GIFs and calls for Ryan to get a raise. Social media is a strange and wonderful tool. I honestly believe that Ryan made a simple typo in his otherwise very courteous response. In the end, Alaska just gained some positive name recognition for thousands on the more left leaning political spectrum — probably some of whom live on the West Coast where Alaska is currently expanding. I would like to thank Marie working the ticket counter Wednesday (7/26) morning at LAX. She was extremely helpful and just amazing! Thank you, thank you, thank you!